Irene Ray. Courtesy of the Indiana Album: Joan Hostetler Collection. In the spring of 1692, a small village in Massachusetts was swept with a hysteria that started after a group of young girls accused several local women of participating in witchcraft and forging pacts with the devil. That hysteria, of course, would lead to the infamous Salem witch trials and in the following months, approximately 150 people would face witchcraft accusations; over 20 of those would be found guilty and put to the gallows. Two hundred and forty-six years later, newspapers across the country would once again run headlines including words like “witch”, “hex”, and “spells” and yet another woman’s life would be ruined due to false accusations of witchcraft. 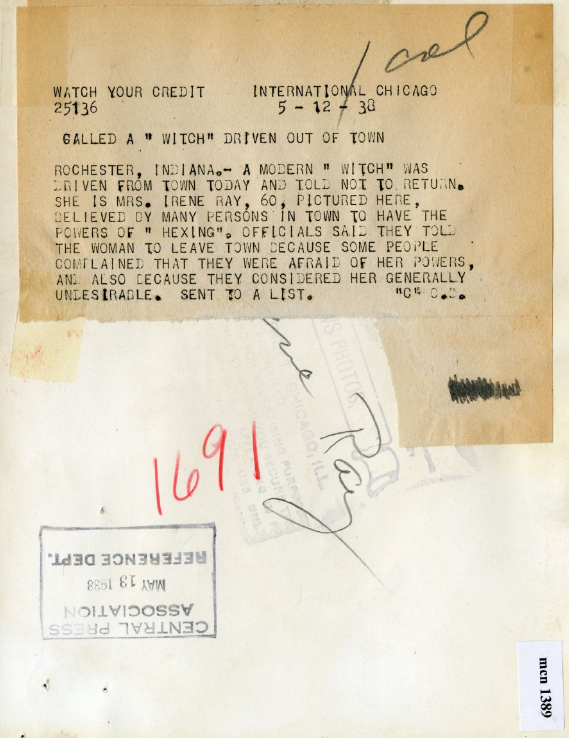 On May 11, 1938, Irene Ray and her husband Charles were driven from the town of Rochester, Indiana due to allegations that Irene was a practitioner of witchcraft and had hexed several town folk. It was alleged that her hexes had caused personal property damage, serious illness, and even death. Irene and Charles had moved to the town six years prior to this unfortunate episode along with their daughter, Iloe, and their cat (a strange fact that many of the newspaper stories were sure to include). What could have happened in the intervening years that would cause the townspeople to call for her removal? When the Ray family moved to Rochester, they settled in a shack on the outskirts of town. One article in the Logansport Tribune even claims that the couple were forced from the nearby town of Plymouth, Indiana before finding themselves in rather dire circumstances in Rochester. Soon, they applied for and were given “relief” or welfare support. They were placed in a house on Audubon Street, where their neighbors soon came to resent them. They were seen as outsiders who were living off of the tax money of the citizens of Rochester who, although themselves poor, did not apply for relief. Georgia Conrad, “victim” of Irene Ray, The Tennessean, June 19, 1938, accessed, Newspaper.com. It may be that Irene herself started the rumors of witchcraft as a way to scare people away from her, relieving the family from taunts and other attacks. No matter how the rumors started, though, soon they spread like wildfire. At first, the townsfolk merely murmured about the witch but after the sudden illness of Georgia Knight Conrad, those murmurs became shouts. Irene had been trying to purchase some antiques from Georgia and had made several visits to her house to pressure the 24-year-old into selling them. On one of these visits, it is said that Irene slipped into Georgia’s bedroom and plucked some hairs from her brush. When leaving, Irene pronounced, “You’ll be sorry soon!” That evening, Georgia fell into a faint and was soon diagnosed as having a “leaking heart valve.” It wasn’t long before the family connected the dots. Another alleged victim of Mrs. Ray was Chief of Police Clay Sheets. After the chief oversaw the removal of Irene’s granddaughter from her home due to charges against the “morals of the household,” newspapers reported that “dancing with rage, Irene screamed: ‘You are just a tool of that Knight Woman and you will be sorry, too!’” A few days later, Chief Sheets died of what appeared to be a heart attack. In addition to human hearts, she was accused of hexing one man’s crops. Mrs. Ray made a habit of taking a shortcut through a field owned by Mr. “Friday” Castle, who didn’t appreciate the alleged witch trespassing on his property. When he confronted her she “ran her eyes back and forth over the patch until they had covered every inch of it. Then she . . . said ‘It won’t make a bit of difference now whether anybody walks on it or not.’” According to Castle, no potatoes sprouted that spring. 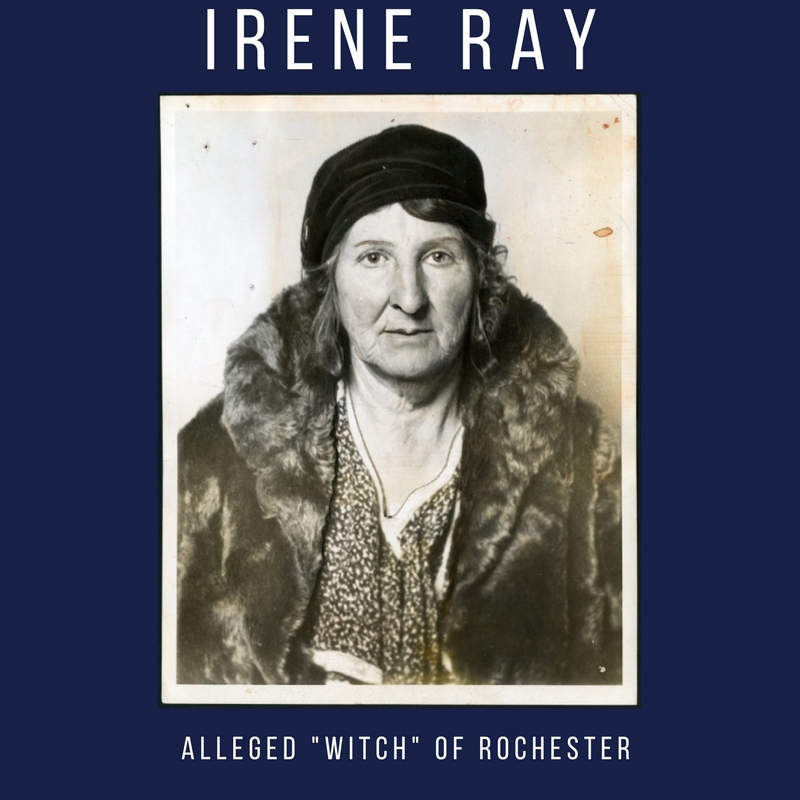 The allegations against Irene Ray mounted and police were increasingly pressured to charge her with witchcraft. 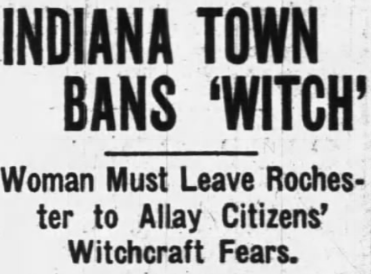 Fortunately, unlike Salem Massachusetts in 1692, Indiana had no laws against witchcraft. The state did have vagrancy laws, in essence making it illegal to be homeless. Irene was charged with vagrancy and arrested, only to be released when she promised the new Chief of Police that she and her family would leave town. Irene Ray press release, May 12, 1938. Courtesy of the Indiana Album: Joan Hostetler Collection. Although Irene denied the accusations against her, saying “The whole thing is wrong. I can’t do anything like that,” she and her husband Charles moved from the town and settled near Manitou Lake. The story of a “witch” being driven from town spread across the country and appeared in newspaper headlines from California to New York. Most were skeptical of the allegations and cast the whole affair in a grim light. In many of the articles, it is mentioned that Irene was of American Indian descent, although Irene admitted that even she wasn’t sure if this was accurate. The inclusion of this fact, along with that of her alleged consultant was African American, suggests that the incident was as much about race as it was about the financial situation of the family. Logansport Pharos-Tribune, November 05, 1938, Accessed Newspaper.com. Just six months later, Irene was hit by a car and died from the injuries. The accusations of witchcraft would outlive the alleged witch. 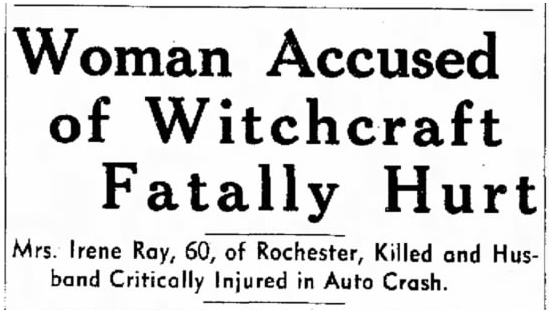 In every article about the accident, her death takes a backseat to the story of her being forced out of Rochester as a witch. Later, when her daughter petitioned to have her stepfather declared of unsound mind (he had sustained a head injury in the accident which killed Irene) the headline focused on the fact that he was the widower of “Rochester’s Noted ‘Witch-Woman.’” It is safe to say now that Irene Ray was no witch, but rather a woman whose neighbors’ dislike and resentment ran so deep that they convinced themselves that she was at the root of their problems.